Who doesn’t love to watch their pups sleep? There is something very comforting about seeing them perfectly at ease and relaxed, able to completely unwind in their surroundings and sleep soundly. It says a lot about just how much they trust us, and how safe they feel! 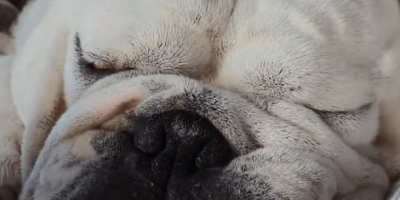 Billy the English Bulldog is a pretty adorable pup, and one that enjoys having his regular naps. After all, being cute can be a lot of hard work – he certainly deserves all that rest! So after finding a comfy spot in bed where he can snuggle up in the blankets with his parent, it is time to get some well-deserved sleep. Doesn’t he look like an absolute angel? The illusion of perfection is only really ruined by how loud he is snoring – but most of us probably won’t mind that at all. In fact, it is likely that most of us would find that super cute! This Adorable Paralyzed Pup Eats Dinner With Her Mom Every Single Night!